Nike did not become a dominant athletic and leisure brand by pussyfooting around. It has always sought the highest profile athletic celebrities and it has never been afraid to court controversy. 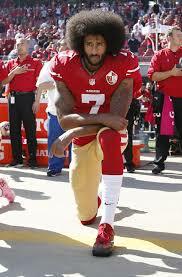 For those who dont know the back story, Kaepernick is an American football quarterback - the most prominent position - who kneeled during the US national anthem before games to protest discrimination and violence against minorities. He was released by his team and has not been re-signed by it or any others, despite his skills, and so has sued his league for conspiracy and violating his rights. People are looking for brands not to just be purveyors of product—they want to know what brands stand for,” David Srere, Siegel Gale co-CEO and chief strategy officer, agreed.